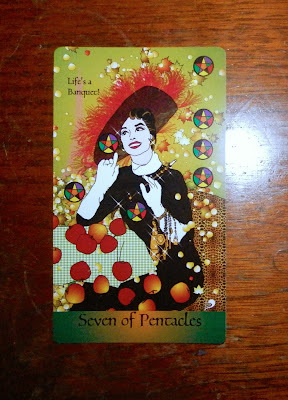 Today's Draw: Seven of Pentacles from the Golden Age of Hollywood Deck. Do you tend to be a creature of habit? Or do you tend to bounce from one thing to the next, losing interest easily? How open are you to trying new things? Yesterday I lamented decks that come without books. And this is another. See, I wouldn't have known this was Rosalind Russell without the "life is a banquet" written on it. And as far as that goes, I had to google the quote to see who said it. Some cards in the deck are, of course, obvious—King Kong, the Marx Brothers, Marilyn Monroe. But many of them I have no idea who they are or what the movie just from the card alone. Only a few cards have quotes on them. And it's not like I'm not familiar with movies from the 30s, 40s and 50s. So it's a little frustrating. UPDATE! Doh! There is a pdf guidebook for this deck at the point of purchase. I looked this evening before I wrote this and didn't see it. Doh! So Rosalind Russel's full quote is, "life is a banquet and most poor suckers are starving to death." It's interesting that this would come up on the eve of the biggest banquet of the year. But what she really means is that there is so much to see and do on this planet and most of us just stick with what's familiar. I can totally see how that applies to me. But on the other hand, I'm not someone who's particularly adventurous to begin with. I have no desire for adrenaline inducing things like skydiving. I'm not into travel. I'm not tempted by weird or even unusual ethnic foods. But in my own way, I do step up to the banquet when it comes to creativity. I have tried so many different crafts that I'm sure I couldn't list or remember them all. I certainly feast at a banquet of tarot and Lenormand decks. And an occupational "hazard" is that I get to peek into many different kinds of businesses and learn a lot about a lot of different things. But when I consider the quote, I have to wonder what's out there that I haven't tried that I might like? I'm pretty much a creature of habit and have experimented enough in life to find enough things that suit me that I feel I live a satisfying life. But what's out there that could put a little unexpected vim in my life? About a year or so ago, my brother gave me his first-generation iPad. Until that time, I had ZERO interest in an iPad and doubted I would even use one. I have two iPod Touches and an iPad is just a bigger version of that. But in taking this device off his hands, kind soul that I am, I discovered how much I really like the iPad. Its larger size is perfect for watching Netflix or reading an eBook as I drift off to sleep. It has become one of my favorite things. So how many more things, experiences, connections, hobbies, etc. might I like that I've just never tried? So Rosalind Russell comes to us today to get us to think of that question and maybe be a little less resistant to things that are foreign to us. That, or she's telling us to fill up on turkey this Thanksgiving. It's cool to know what you like and stick to it. But it's also cool to continue to explore for new things to like and stick with, too.